SCR2 N-85 Titan Tankless Water Heater Discounts Apply ! The Titan SCR2 N-85 continually heats water instantaneously as you require it - and only when you require it. 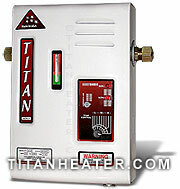 The Titan unit completely replaces a conventional tank heater with no disruption to your comfort and hot water needs. This unit is highly recommended in areas with warm climates where the incoming water temperature is above 69° degrees Fahrenheit.